It’s no secret that mattress shopping in San Diego isn’t the most fun and easy thing to do. 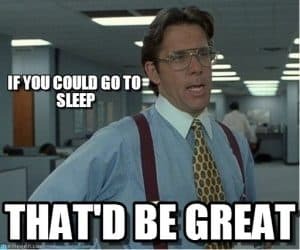 It also doesn’t help when you have mattress companies capitalizing on customers lack of knowledge when it comes to mattresses and mattress shopping. This has led to many unhappy customers throughout the industry, and the mattress industry as a whole has gained a very bad reputation that has been compared to the used car industry, no offense if you’re reading this and in the used car business. We’re going to share with you the 9 most common mattress shopping mistakes and how to avoid them. We’re not saying to completely discredit other people’s opinion especially friends and family, but when it comes to mattress shopping you want to keep in mind that your body is completely different from other people. We are each unique and have different preferences when it comes to comfort and a mattress should fulfill our needs for our body. Some people have more sensitive shoulders and hips which may result to enjoying a softer mattress whereas other people may really like the firm surface. Your sleeping position which is a big factor when choosing a mattress may not be the same as your friend who recommended a particular mattress. To avoid this mistake you want to stay away from specific mattress recommendations and focus on their experience with the particular company they worked with. Ask them about the customer service, did they charge for delivery, were the salespeople knowledgeable in the materials and mattresses or were they using sleazy sales tactics? These are good questions to ask when asking friends and family and reading review sites when mattress shopping so you know who you are working with. One of the biggest mistakes people make when purchasing a new mattress is believing the myth that firmer is better. We see it all the time that people convince themselves in getting a firm mattress because they think it’s better for them, when in reality they should have trusted what their body was telling them and go with one that felt better, even though it was a little softer. Getting a mattress that is too firm can cause painful pressure points on the hips and shoulders causing you to toss and turn trying to get comfortable or even cutting off your circulation. Another problem with buying a mattress that is too firm, is that it is not conforming to your curves properly. If a mattress does not contour to your body then the muscles around your spine will be forced to overcompensate for the lack of support thus you may end up with back pain. We love getting good deals just as much as the next person but have you ever stopped and wondered how a mattress store can really sell a mattress for 50, 60, or even 70% off and still be in business? Not only that but it seems like these sales are going on every week. Well, here’s a little secret about the mattress industry. The average mattress retailer marks up their mattress prices 200%-500%! I know it’s hard to believe but it’s true. So a king mattress that may cost a big box retailer $900 typically sell for $3,500-$5,000! With prices that high they’re able to do 50% off sales and still have huge profits. Another reason prices tend to be spiked high is because certain brands have pricing requirements and each mattress is touching multiple hands to finally reach you. So there is a lot of expenses that are spend before it’s on the floor. So here’s a tip when mattress shopping look for local manufacturers in your area. They don’t carry the big brands so they’re not locked into price requirements and also they’re usually more connected with their customers so they have their customer’s best interest in mind. We know it can be tempting to flop down on every mattress to make sure you’re getting the right one, but trying every mattress is a recipe for confusion and “paralysis by analysis”. When trying out too many mattresses it’s so easy to get overwhelmed and confused and then everything else starts to feel the same, almost like wine tasting. Best solution is doing a comfort test first by trying out a firm, medium, then a soft, and picking the best feel in that category. Doing that will narrow down your choices in the showroom and make it a lot easier to select a mattress. We recommend narrowing it down to 2 or 3 mattresses and then taking at least 10 minutes on each one to get a better idea of the comfort that is best for you. We understand a mattress purchase is a large investment and figuring out how much you’re willing to spend on your mattress purchase is a good idea. However, you want to have realistic expectations when beginning the process. Just because you saw a $300 queen size set for sale at one store doesn’t necessarily mean it’s a quality mattress even if it did have a really cool cover and design, and if you do decide to buy mattress at that price don’t expect it to give you 10 years of comfortable sleep. Heck, we’ve seen $2,500 queen mattresses last only 2-3 years! So how do you avoid this mistake? You want to pay attention to the quality of materials inside the mattress. To understand more about how to determine quality materials click here. Unfortunately in the mattress industry you don’t get what you pay for and purchasing a big name brand is the epitome of this being true. Here’s a little background on the mattress industry, about 60%-70% of the market is owned by two very large companies. We won’t name names here but we’ll call them the “big S” companies (with one T). These companies really drive the direction of the industry and over the years we have seen the quality of their products slowly decline. The mattresses may feel very comfortable and look very nice but it’s what’s on the inside that counts. Also keep in mind with the brand name comes insane markups because of high overhead cost. So instead of focusing on brand, focus on craftsmanship and the material that make up the mattress. Did you know we spend about a third of our lives in our beds? That is a lot of use our mattress gets. So something that is being used everyday and is very important to our health probably shouldn’t be purchased blindly. Wouldn’t you agree? A mattress is the most important piece of furniture in the home and time should be invested trying out different mattresses. You want to find the one that fits your needs and I’m sorry but there is no “one size fits all” mattress. To avoid this mistake first understand what the 3 most important things a mattress should do explained here and then spend at least 10-15 minutes on the two you like the most and compare them. Spending 10-15 minutes testing a mattress gives you a good amount of time for your body to adjust to the surface. If you have time to lay longer then go for it. The longer the better. Ok, that may sound blasphemous coming from a mattress store, but we said SOLELY on comfort. We know that comfort when it comes to mattresses is for most people the most important thing. However, buying a mattress ONLY because it’s comfortable after laying on it for a couple of minutes doesn’t mean you should buy it. The truth is it’s not all that difficult to make a mattress with very cheap materials and very low cost feel comfortable, but it doesn’t mean you should buy it. When it comes to mattresses you’re looking for something that is not only comfortable but also durable. 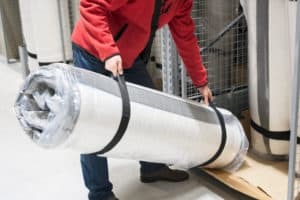 To avoid this mistake during your mattress shopping journey you want to test out several different mattresses and when you narrowed it down you want know what are the materials being used in the mattress. Quality materials is key here if you’re looking for a mattress that will give you lasting comfort. One of the biggest traps we see shoppers fall into is falling for the coil count myth. Don’t get me wrong, coil counts can play a role in the quality of a mattress but that should not be a primary motivating factor when purchasing a mattress or determining mattress quality. 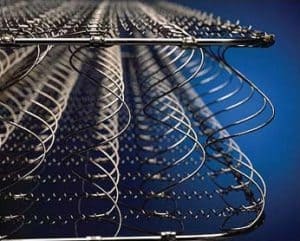 There are way too many variables in comparing coil counts and coil technology and comparing mattresses based on coil counts can lead to a lot of confusion and misinformation. Coil quality is affected not only by the amount of coils but also the type of coil, the thickness of the coil and the amount of wire in the coil. So it’s best to avoid the coil count conflict unless you are comparing apples to apples, and even then it’s best not to even go there. 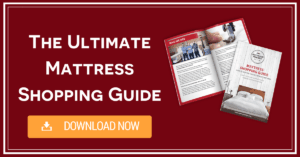 For more mattress shopping tips download our FREE Mattress Shopping Guide.